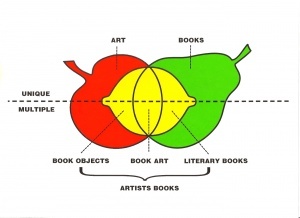 Phillpot's Artists’ Books "Fruit Salad" Diagram, 1982. Clive Phillpot (1938, Thornton Heath, Surrey, England) is a specialist in artists' books, as well as a writer, curator, and librarian. After getting his start as a librarian at the Charing Cross Public Library, London, and the Chelsea School of Art, London, Phillpot served as the director of Museum of Modern Art Library from 1977 to 1994. Phillpot founded MoMA Library's collection of artists' books, regularly sourcing materials from Printed Matter, the New York-based distributor of artists' publications founded by Lucy R. Lippard and Sol LeWitt. He also facilitated the acquisition of the Franklin Furnace Artists' Book Collection by MoMA Library in 1993, then the largest in the country. He also served as the president of the Art Libraries Society of North America in 1989. Through his writing and criticism in the 1970s and beyond, Phillpot was instrumental in defining and bringing attention to the medium of artists' books. He made a distinction between bookworks (artworks dependent on the structure of the book) and book objects (artworks that allude to the form of the book) and favored multiple over unique books, due to their potential for distribution. Phillpot also made frequent use of the concept of the "bookwork" coined by Ulises Carrión to describe artists' books that consciously investigated the structure off the book as a space-time sequence. These distinctions are reflected in Phillpot's collecting strategy at MoMA Library, where, as a rule, he only collected artists' publications released in an edition of 100 or more. Phillpot is also considered to be an expert on pioneering mail artist Ray Johnson and he corresponded with Johnson throughout the 1980s and 1990s. Many of Phillpot's mail art exchanges with Ray Johnson are held in the MoMA Library collection. ↑ Clive Phillpot, "Some Contemporary Artists and Their Books", in Artists' Books: A Critical Anthology and Sourcebook, ed. Joan Lyons, Layton, UT: Peregrine Smith, and Rochester, NY: Visual Studies Workshop, 1985. ↑ Ashley McNelis, "Clive Phillpot", Bomb Magazine, 14 Jan 2015.
co-editor, with Trevor Fawcett, The Art Press: Two Centuries of Art Magazines, London: Art Book Company, 1976, 63 pp. Essays published for the Art Libraries Society on the occasion of the International Conference on Art Periodicals and the exhibition The Art Press at the Victoria and Albert Museum, London. "Recent Art and the Book Form", in Artists’ Books: From the Traditional to the Avant-Garde, New Brunswick, NJ: Rutgers University Press, 1982.
editor, Art Documentation 1(6): "An ABC of Artists’ Books Collections", ARLIS/NA, Dec 1982, 13 pp. Special section of the journal. "Some Contemporary Artists and Their Books", in Artists' Books: A Critical Anthology and Sourcebook, ed. Joan Lyons, Layton, UT: Peregrine Smith, and Rochester, NY: Visual Studies Workshop, 1985. "Art Library 2000", in Reader in Art Librarianship, ed. Philip Pacey, Munich: K.G. Saur, 1985. "Reading Artists' Books", in The Arts of the Book, Philadelphia: University of the Arts, 1988, pp 5-7. This page was last modified on 30 July 2018, at 18:55.